Outside the Trinitarian Abbey Church, which was restored by the Earls of Dunraven in the 19th century as the Roman Catholic parish church of Adare, Co Limerick, stands a tall obelisk-style mounted surmounted by a Celtic cross with carvings in relief. 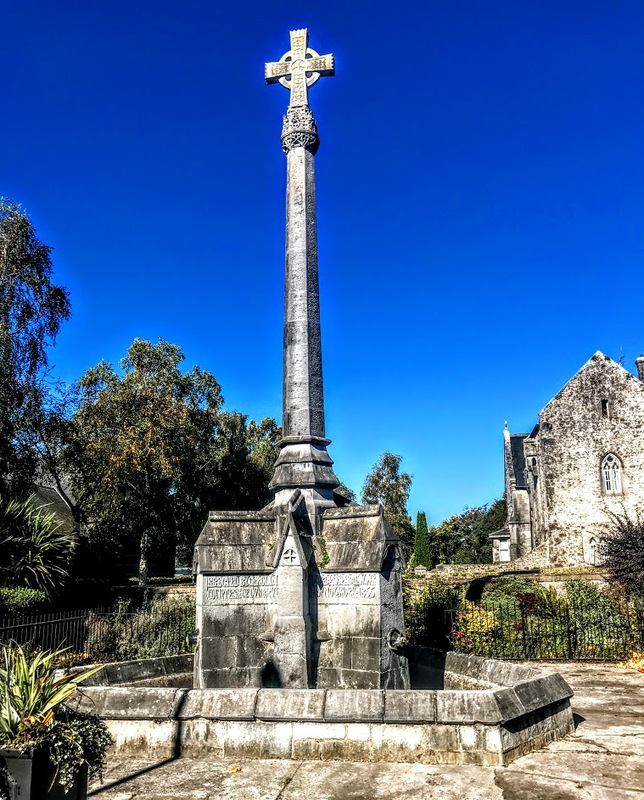 This marks the fountain erected in the heart of the village in 1844, and the carved trefoil and cross motifs hint at the religious piety of the woman who donated this fountain to Adare. The fountain is an early work by Philip Charles Hardwick (1822-1892), the architect who carried out much of the restoration work in Gothic Revival style at both Adare Manor and the parish church. But who was Caroline Countess of Dunraven? Caroline Wyndham (1790-1870) was born on 24 May 1790 at Clearwell Court in the Forest of Dean in Gloucestershire. Although the Wyndham family of Dunraven in Glamorgan had no titles or peerages, they were one of the leading families in South Wales. Caroline’s diaries, letters and annual reflections indicate that, even as a teenager, she was a deeply religious woman who had been affected by Methodism and by the evangelical revival that began in the 1780s. From the day of her 18th birthday in 1808 until her death in 1870, Caroline kept a diary that forms part of her archive, together with annual reflections and letters. 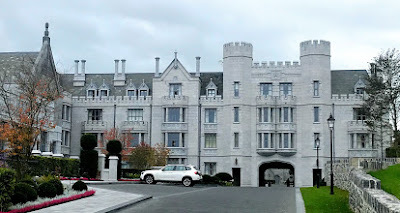 Caroline was a rich heiress when she married the Hon Windham Henry Quin of Adare Manor in 1810, and he eventually succeed his father as the 2nd Earl of Dunraven. Valentine Quin (1752-1824) presumably chose the title of Dunraven when he was made an earl in 1822 in honour of his daughter-in-law, and the Quin family eventually changed their name to Wyndham-Quin. She was a remarkable lady: immensely energetic, ambitious and good humoured, she was also extremely sensible and careful about money. Architecture was an interest she shared with her husband. As well as taking an active part in the restoration of Adare Manor and the village churches, Caroline continued to take an active interest in the life of the church in Gloucestershire village where she was born, and a copy of her portrait hangs in the vicar’s vestry in Saint Peter’s Church, Clearwell, in the Forest of Dean. Caroline financed the building of Saint Peter's Church, the mortuary chapel, the repair of the 14th century cross, work at the local school, the building of the cottage hospital and a new frontal on Saint Anne’s well, all at Clearwell. For this work, she commissioned the architect John Middleton (1820-1885), who, like Hardwick was an exponent of the Gothic Revival. Clearwell has the most examples of his work in one village anywhere in England. She and her husband also set about rebuilding Dunraven Castle in Glamorgan. 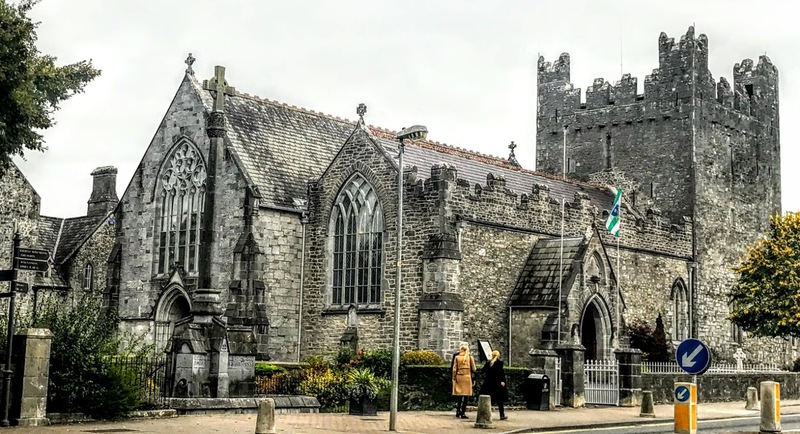 Her fountain in Adare sits next to the Holy Trinity Church in a prominent place on the Main Street and it contributes significantly to the streetscape of the town. The monument displays fine stonemasonry and artistic skills, and the lettering and carving at the base of the cross are particularly fine. Although no water now flows from the cast-iron spouts on the three sides, the fountain remains a curious historical and artistic item in the town. I spent the last three days [8-10 October 2018] in Adare, Co Limerick, at the annual conference of the clergy of the dioceses of Limerick and Killaloe and Tuam, Killala and Achonry. Apart from the conference programmes, and the opportunity to renew friendships with priests in this diocese, there were times to worship together, to eat together and to share stories. 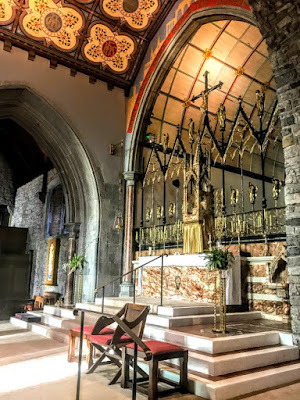 On one afternoon this week, two of us visited Holy Trinity Abbey Church, now the Roman Catholic parish church in the centre of this picturesque estate village. The Trinitarian order was founded in France in the early 12th century with the purpose of rescuing hostages taken from the Crusades in the Holy Land. A panel from the stained-glass window above the altar in Adare shows a monk about to redeem a hostage. There were about 20 Trinitarian foundations in England and Scotland, but Holy Trinity Abbey in Adare is the only example of a church of the Trinitarian order in Ireland. The date of the arrival of the Trinitarian order in Adare unknown. 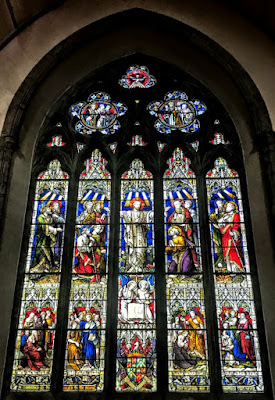 Saint James was the patron of the abbey in Adare, and it may well have been in existence long before 1226, when Geoffrey de Marisco, an Anglo-Norman feudal lord, obtained a grant to hold a fair at Adare during the eight days following the feast of Saint James. But de Marisco fell out of favour with the king and his allies in Ireland and ended his days in exile in France. 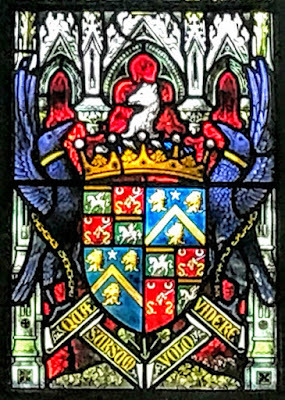 John FitzThomas FitzGerald (ca 1265-1316), 1st Earl of Kildare, who held lands throughout Ireland, may have endowed the abbey in the late 13th century rebuilt it in 1272, when he was attempting to force his cousin’s widow, Agnes de Valence, to hand over her estates in Co Limerick. The original monastery housed a range of monastic buildings, with an inner cloister, enclosed on four sides by a church, a dining area, dormitories and workshops. 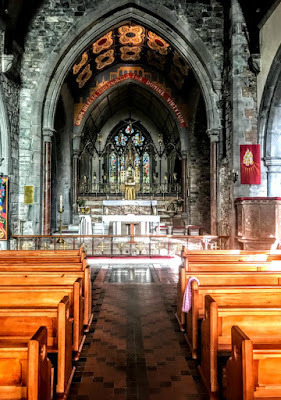 Peter, the minister, and three other canons at Adare were accused of seizing goods from their neighbours, the Augustinian friars in Adare, in 1319. John Arbibard became minister of the ‘Hospital House of St James of Hathdar’ in 1497. Thomas de Geraldinis became minister at the abbey in 1506. With the dissolution of the monastic houses at the Reformation, the abbey was dissolved in February 1539. Despite popular belief and local lore, the prior was not beheaded, having refused to take the Oath of Supremacy, nor were 42 monks from the abbey imprisoned. The abbey was leased to James Gold in 1583, and it was granted to Sir Henry Wallop in 1595. But within a century, the abbey was the property of the Earl of Kildare. In 1683, he granted possession of the abbey to Thady Quin (1645-1725), a lawyer and a descendent of the O’Quin family of Inchquin, Co Clare. By the early 19th century, the abbey was in ruins, and the church was first restored in 1811, when Valentine Quin (1752-1824), 1st Earl of Dunraven, reroofed the church and added the north transept. Wyndham Quin (1782-1850), 2nd Earl of Dunraven, made a gift of the ruined abbey to the Roman Catholic parishioners of Adare in 1824 and he initiated a programme of restoration that was continued by his successors. In 1852, Edwin Wyndham-Quin (1812-1871), 3rd Earl of Dunraven, had the church repaired and expanded to fill the space that once contained the mediaeval cloister. 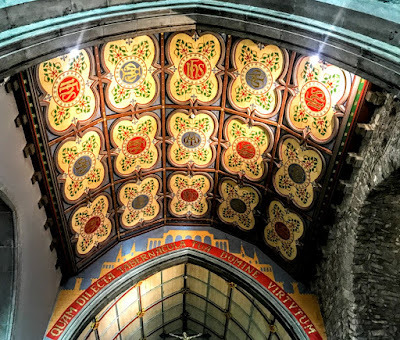 Dunraven employed the English architect Philip Charles Hardwick (1822-1892), who worked in the Gothic Revival tradition of AWN Pugin to restore and enlarge the church while taking care to maintain the fabric of the historic building. Most of Hardwick’s known Irish commissions appear to have resulted either directly or indirectly from the patronage of who employed him to complete Adare Manor and to carry out other work in the village of Adare. Hardwick also built a church for Lord Dunraven at Sneem, Co Kerry. Dunraven was closely involved with Saint Columba’s College, Rathfarnham, for which Hardwick designed additions. Hardwick’s work at Adare probably resulted in the commissions he received to design Saint John’s Roman Catholic Cathedral and Mount Saint Alphonsus, the Redemptorist Church in Limerick city. 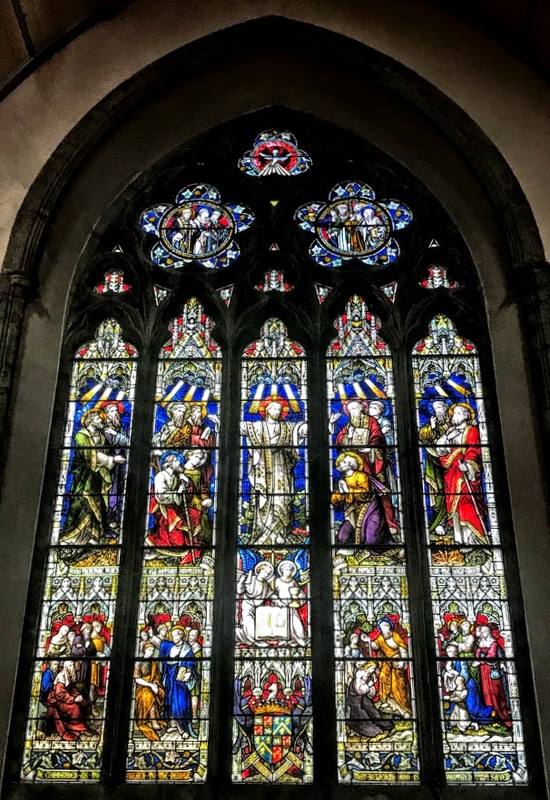 During Hardwick’s restoration of the church in Adare in the 19th century, the remains of the mediaeval church, including the nave, chancel and tower, were incorporated into a new parish church, and a triple lancet window was restored as the east window. During that time, the residential buildings on the site were also renovated and converted into a convent for the Sisters of Mercy and a school for girls. 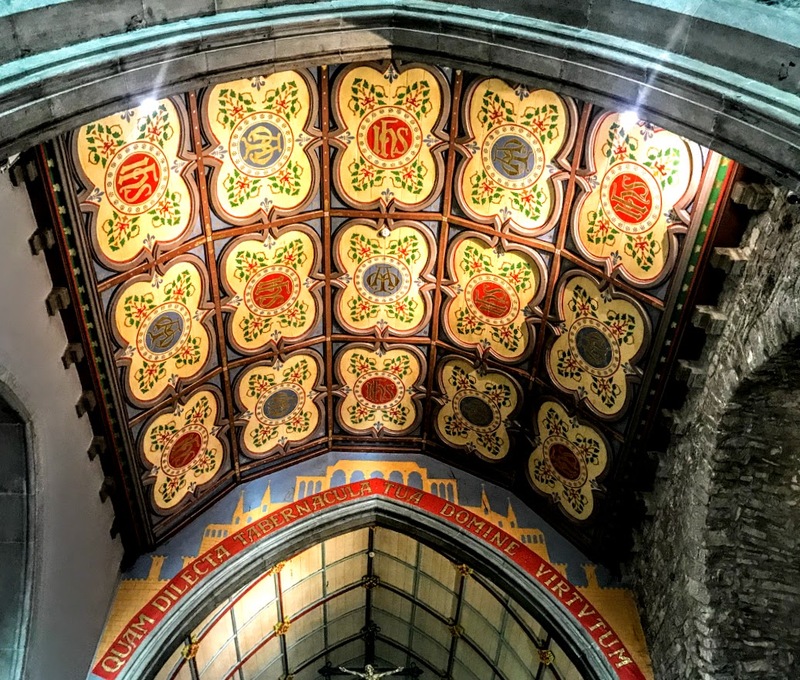 The church as we see it today represents a fusion between the mediaeval remains and 19th-century Gothic Revival architecture in a radical building programme that lasted until 1884. Much of the interior work and decoration was the work of George Goldie (1828-1887) of Goldie and Child. Goldie also designed a new chancel, high altar, reredos, tabernacle and east window in Saint Saviour’s Dominican Church in Limerick in 1863-1666, and remodelled the interior and exterior there in 1870. In Adare, Goldie replaced the north nave wall with circular columns, moved the nave into a new section, and rebuilt the east chapel as a Lady Chapel. Goldie added a north aisle with decorative buttresses to the external wall, greatly increased the size and complexity of the interior, and made the mediaeval tower which, until then, had been central to the church, part of the south aisle. In March 1884, the restored church was blessed as the Roman Catholic parish church of Adare by George Butler (1815-1886), Bishop of Limerick. The multiple phase construction adds much of historical and architectural interest to the site. The ornamentation in the façade is focussed mainly on the openings, where fine stone work and artistic interest are found in fine stone crafting such as the floral motif stops and the elaborate and varied window tracery. Inside, the many interesting details include the altar screen, font and pulpit, as well as early stained-glass windows and the painted and timber ceilings. The mediaeval highlights include the tower, nave and part of the choir, and the timber roofs. 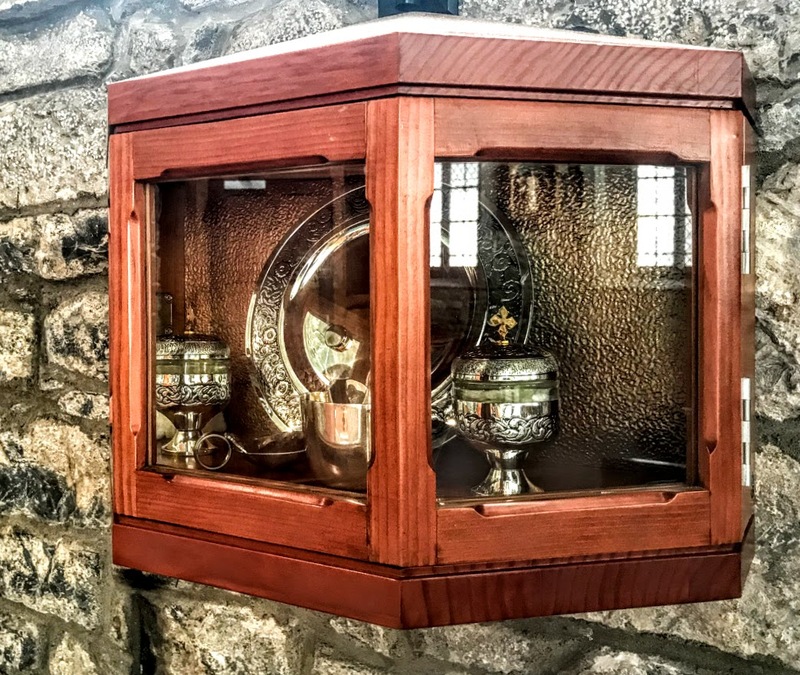 A 19th-century description of the Quin Chalice of 1726 recorded that the chalice was preserved in the Roman Catholic Church at Adare. 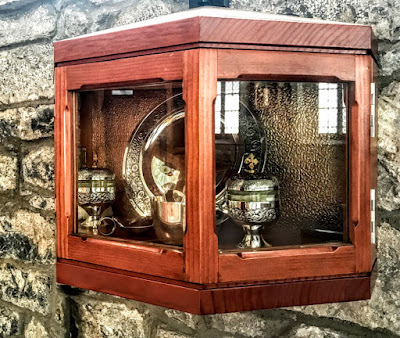 The Quin chalice is still used by the church for special occasions concerning the Wyndam-Quin family. A major programme of critical repairs and elective works began on the roof and external walls in 2010. 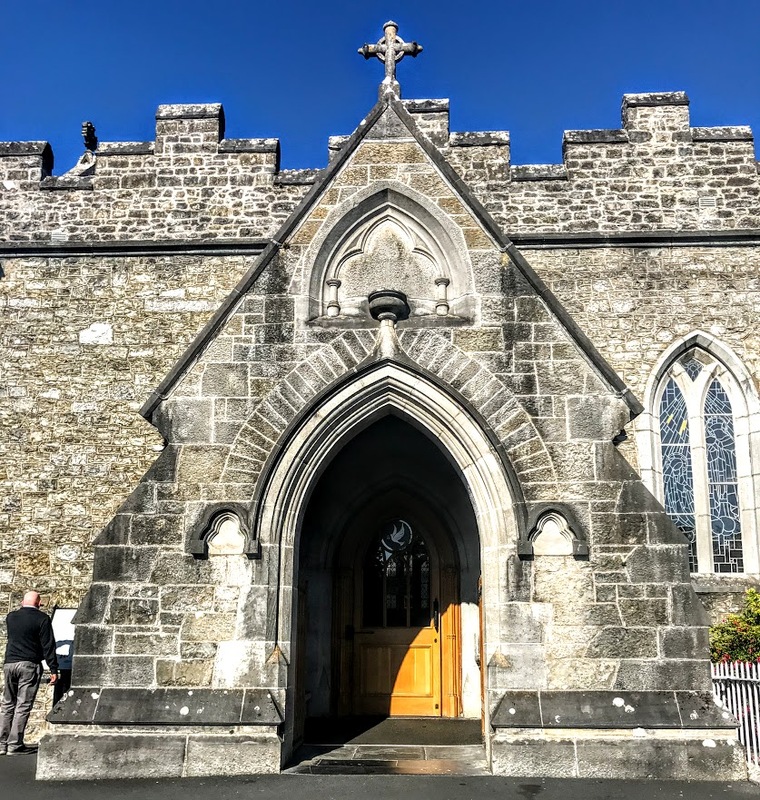 As it stands today, the church presents an imposing and prominent feature on the main route into Adare from the east, which is further outlined by the tall 19th-century nave and tower.